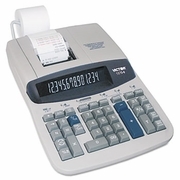 14-digit fluorescent display for larger business calculations. Computes investment values and calculates loan payments. Two-key tax function for automatic addition of two different taxes to sales total. Clock/calendar function displays and prints time or date. Manufacturer's limited three-year warranty.